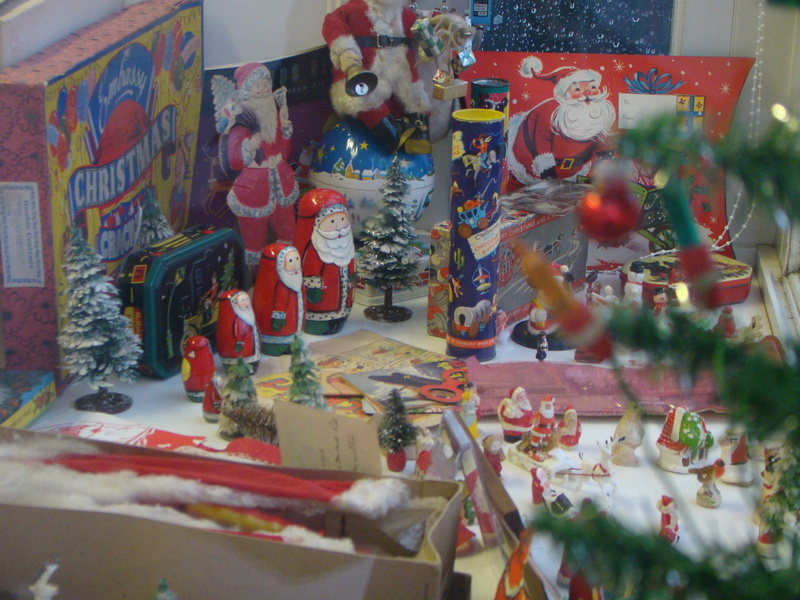 For Christmas, and until early January, there is a seasonal display of toys and games in the Town Trustees’ cabinet in Alresford library. 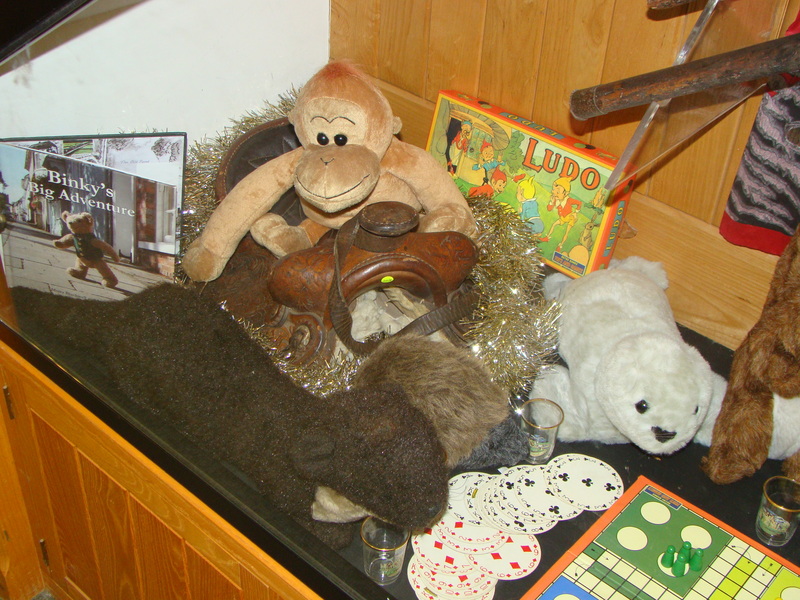 The Christmas display includes a selection of toys from the Alresford Museum stores, including several soft toys, like Teddy Bears and other animals from Alresford Toys, a business that had a factory some years ago in the Town Mill, in the station car park, and other makers. Vintage cars and old toy soldiers are on display, plus the “Ludo” board game, alongside more modern additions like the Binky story book – plus Buzz Lightyear is hiding in there too. Other local items are on show, like the leather saddle, made in Alresford by Alresford Saddlers, and a very old face from a grandfather clock also made in Alresford: this one seems to be named Howes, rather than the ‘Evans’ name you might have expected! 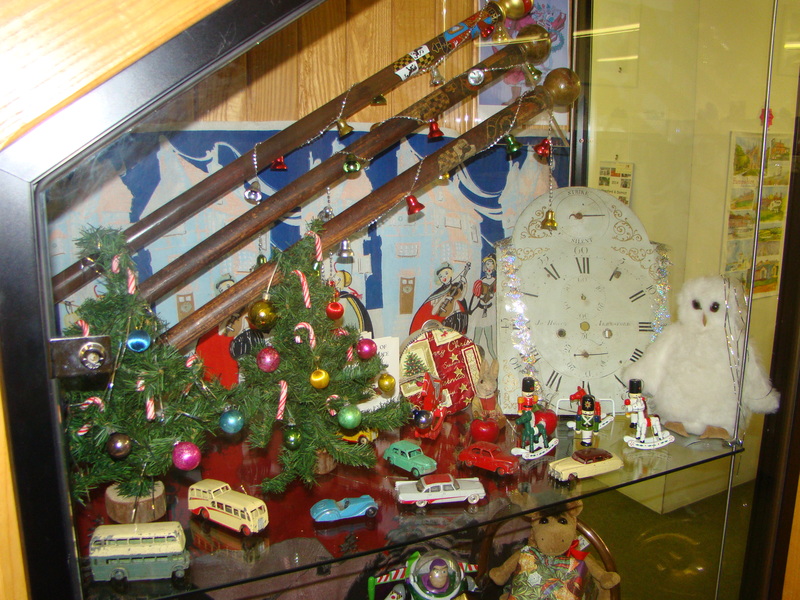 The library has also added to this theme, with a display of old-style biscuit boxes in the window, plus also a display of Christmas toys and decorations by Bob Leggett (tel 733475) whose collection of such things spans over a century. In addition there is a new display from the Alresford Museum in the separate cabinets on show in the Old Fire Station, where Artworthy Framing operates their picture framing business. The display is visible during shop opening hours, Tuesday to Saturday every week. 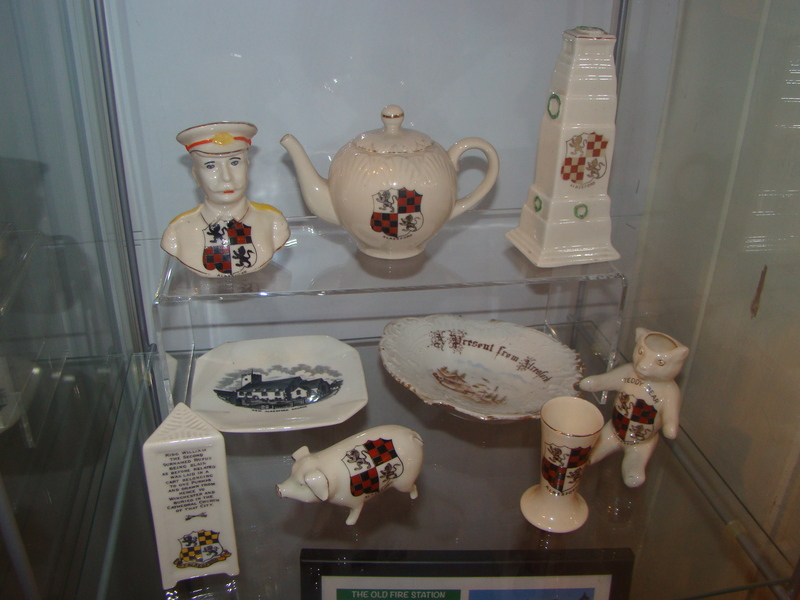 The new museum cabinets show a selection of crested miniature china souvenirs bearing the Alresford crest, which was produced over the years for tourists and maybe even official dinner table settings. This was very popular in the late Victorian and Edwardian era. At least in modern times, the Alresford coat of arms does seem to be accepted to have the chequer-board coloured in gold (or yellow) and black, but the crested china has two distinct styles, one gold/black and one a red-brown colour and black. The origin or reason for the red-brown colour is unknown, maybe it was dating from an earlier period, or was easier to manufacture? Or maybe one supplier just got the colour wrong? If anyone knows please let us know. Also there are various information sheets illustrating the history of the town: these feature the Old Fire Station itself, and the history of the Alresford Fire Service; Broad Street, and the annual Michaelmas Fair; The Avenue leading to the town along the Winchester Road, and its trees; and the Eel House on the River Alre, where the building has recently been restored, and where the eel traps are to be reinstated for demonstration purposes only – there will be no harm done to any eels! 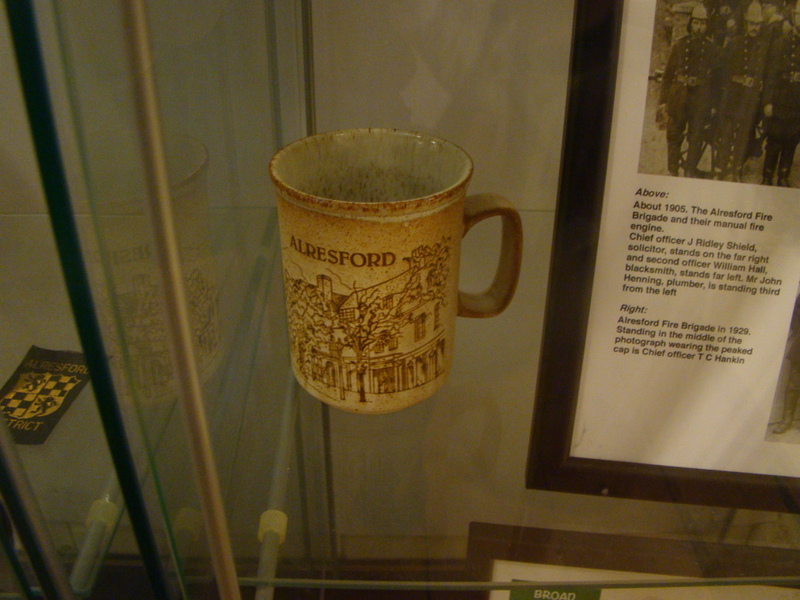 The Alresford Museum is a separate section of the New Alresford Town Trustees, which is a registered charity: see www.towntrust.org.uk. 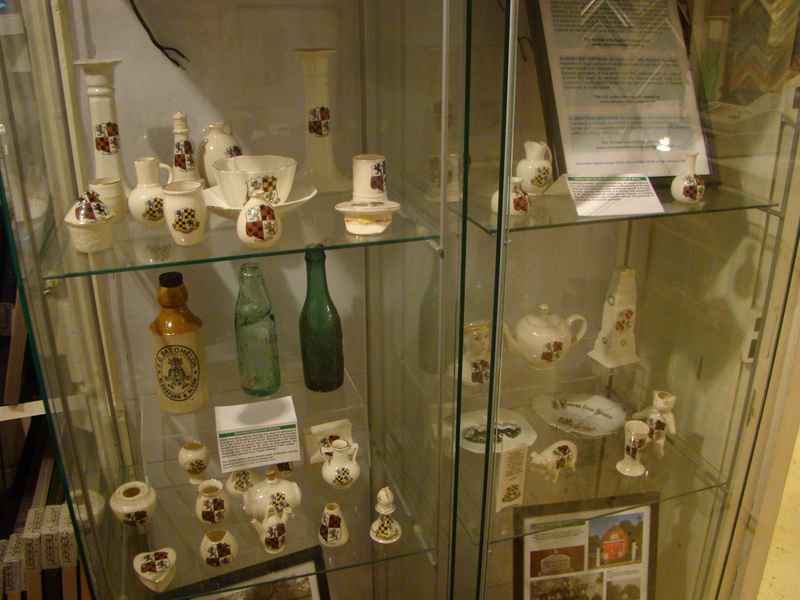 At the moment the museum has no full time premises, so organizes separate displays in these cabinets and in the photographic panels in the Broad Street passageway and at Oakleaf Stationery.